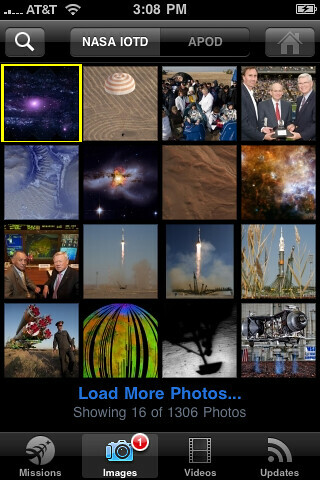 The NASA App collects, customizes and delivers an extensive selection of dynamically updated information, images and videos from various online NASA sources. Users can access NASA countdown clocks, the NASA Image of the Day, Astronomy Image of the Day, online videos, NASA’s many Twitter feeds and other information in a convenient mobile package. It delivers NASA content in a clear and intuitive way by making full use of the iPhone and iPod touch features, including the Multi-Touch user interface. The New Media Team at NASA’s Ames Research Center at Moffett Field, Calif., developed the application. The NASA App also allows users to track the current positions of the International Space Station and other spacecraft currently orbiting Earth in three views: a map with borders and labels, visible satellite imagery, or satellite overlaid with country borders and labels. Yeah, it’s free and very good. Even better: Akamai is letting us watch NASA TV — LIVE — on your iPhone. That’s cool. This entry was posted on Tuesday, October 27th, 2009 at 6:55 am	and is filed under Business Network, Front Page. You can follow any responses to this entry through the RSS 2.0 feed. You can leave a response, or trackback from your own site.